Grace isn’t who Henry pictured as his dream girl—she walks with a cane, wears oversized boys’ clothes, and rarely seems to shower. But when Grace and Henry are both chosen to edit the school paper, he quickly finds himself falling for her. It’s obvious there’s something broken about Grace, but it seems to make her even more beautiful to Henry, and he wants nothing more than to help her put the pieces back together again. And yet, this isn’t your average story of boy meets girl. Krystal Sutherland’s brilliant debut is equal parts wit and heartbreak, a potent reminder of the bittersweet bliss that is first love. 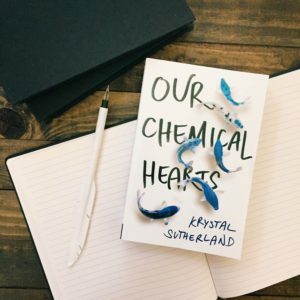 Despite some of the negative reviews I read, I still gave Our Chemical Hearts a chance. I’m glad that I did. It ended up being an amazing book that I devoured in a day. Henry’s relationship with Grace was emotional and upsetting, but his relationship with his family and friends more than made up for it. I don’t even know where to begin to explain how amazing Our Chemical Hearts was. From the first chapter I was sucked in. Since it is a book about first love I thought it was also going to be love at first sight because Grace was perfect and a beautiful super model. That wasn’t the case, at all, and I was hooked. Grace was weird and mysterious, but I soon learned why. The emotions from her story were intense. It made my heart hurt and my gut twist. Our Chemical Hearts wasn’t all sad though. The way Sutherland writes had me laughing so many times, especially when Henry was with his two best friends Murray and Lola. I couldn’t get enough of the humor in the story. I absolutely adored Henry’s relationship with Murray and Lola. Too many times I’ll read a YA romance and the main character has a best friend who ends up all but forgotten when they fall in love – which is totally not cool and I have always disliked that. Fortunately, that was not the case in Our Chemical Hearts. Through Henry’s whole roller coaster relationship with Grace, Lola and Murray are there for Henry. The best part is Henry doesn’t forget to be there for them too. 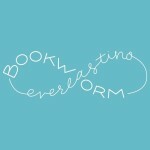 I’m glad I give books I have an interest in a fair try despite negative comments about them. I would have missed out on a great book if I had listened to them this time.